In the last entry I pointed out some issues that were discovered during out terrain review and tackled the first task that was at hand – clearing fields of observation and fire. Referring back to that entry you’ll see that I contrasted the effort taken to increase our fields of fire and observation while reducing our deadspace with the fact that the measures implemented had another effect. It effectively reduced the threats cover and concealment and increased their field of observation. During the course of this case study I intend to frequently contrast how measures taken will affect both our position and the threats capabilities. In this entry we’re going to look at some forms of Cover (the first part of the the C in OCOKA) and develop not only our concept of how we can employ cover to continue building our defensive plan but weigh some of the advantages and disadvantages of different types of cover. First up is a review of what cover is and isn’t. Cover is routes and locations we can use to provide protection from threat fire. For our purposes cover is going to be mass (think thickness) and defilade (below terrain level) as those two types of cover are the simplest. Cover may or may not obscure you from enemy observation (that’s concealment which is the next entry). Key concept: Cover doesn’t always = concealment doesn’t always = cover. There’s a maxim I want to keep in mind while planning all of this: When and wherever possible I want to maximize the use of concealment for positions that provide cover. 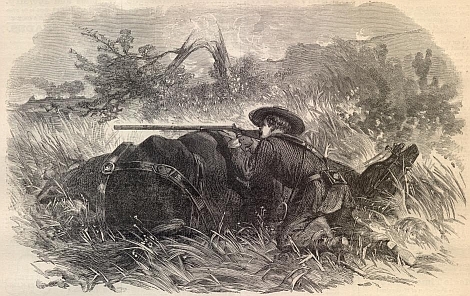 Being able to fire from a protected position that is difficult to spot is a good thing as is being able to shield oneself from fire while remaining unobserved. 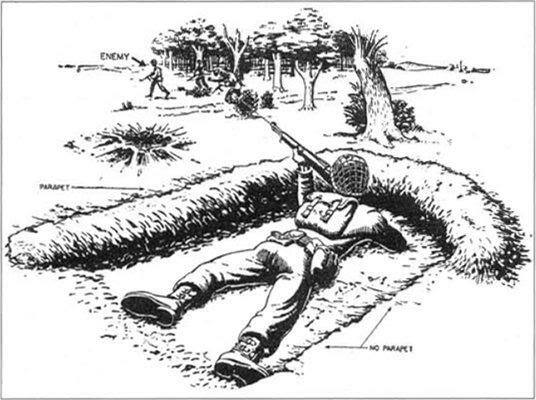 When we think of traditional cover normally the first thing that pops into mind is a foxhole or bunker. There’s a wide variety of Defensive Fighting Positions (DFPs) that can be employed and not any one is going to be the best all around solution. And the methodology of where to put those positions is going to be solely dependent on your terrain evaluation and defensive plan. I will state this – you need to individually evaluate EVERY defensive position using the defensive methodology I addressed in the concepts entry to estimate its initial effectiveness. Just going out and digging positions most of the time results in a haphazard defensive posture. From my experience when left to their own devices people will find the easiest soil to dig in which probably won’t yield the best results for the labor involved. Is this position sited to provide the best capability of defense in depth, mutual support, and interlocking fires in relation to the anticipated threat axis of attack and other defensive positions? Will this position be fast or easy to get into and out of? Will the threat be able to use this position against my Final Defensive Position (FDP) if he gains it? Will this position help my egress if I make the decision to bug out? If the answers to those questions are no then put the shovel down Homer. You’re probably wasting your time and possibly creating more issues than you’re solving. A defensive position I’m an advocate of is the “hasty defensive position”. This is also known as a “scrape” or “skirmishers trench”. 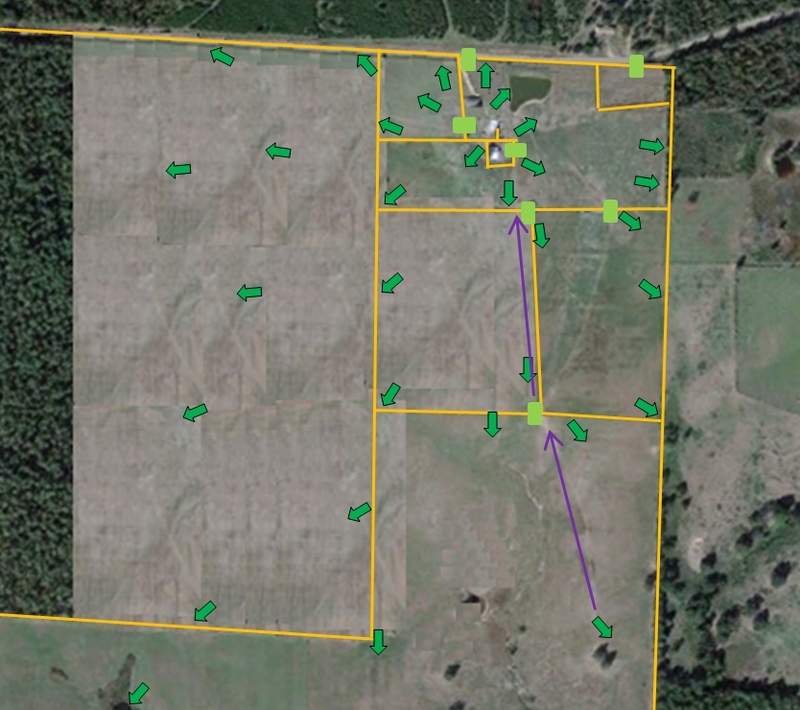 I’m rather partial to this one for our purpose because not only can it be developed without a huge effort but it minimally impacts the capabilities of the ranch to remain operational. Since my immediate terrain is relatively flat this position is going to be one of my mainstays. A scrape is nothing more than a hole dug that is approximately 18 inches in depth and 24 inches in width and the length of your body. Normally the dirt that you removed is piled in front and sides of the position to increase cover towards the direction you believe you will take fire from. The picture below illustrates a hasty scrape. This type of position offers cover from threat fire and get us into partial defilade (below the level of the ground) however it has a few disadvantages. It can be difficult to fight out of when it comes to reloading or moving out of to shift positions. It can also be difficult to gain or retain situational awareness in the fight because folks tend to become “forward oriented” and develop tunnel vision due to their prone posture. When rear or side cover is not in close proximity the shooter will often tend to become fixed in that position. That in itself is a danger because once the threat has fixed your position you need to assume that it’s going to maneuver and attempt to catch you in a cross or flanking fire. If you have numerical superiority (which I am presuming we won’t) then this type of position becomes more tenable. When I was a young troop my Platoon Sergeant had a drill we would conduct where on cue the entire platoon had to dig into hasty positions in under ten minutes. We called it “e-tool madness”. I asked him once why a hasty and his response was “It’s better than no position at all”. It was true then and it’s true today. Notice in a typical hasty position the threat has 18 inches of frontal cover facing the FDP. And if he gets into the position he gains 18 inches of frontal defilade. In the modified hasty position he is limited to 4 inches of frontal cover creating by embedding a sandsack 1 to 2 inches deep in front of the position (try hiding behind 4 inches of cover) and if he gets into the position in order to fire he’ll have to go shallow in it thereby more than likely exposing himself to our fires. Additionally this helps our egress out of the hole towards our FDP. It’s easier to sprint up a slight incline than it is to leap and run out of a hole. You have to be creative in your development of cover. At this point I’m not going to go into how to develop cover inside and immediately around the FDP (the house and outbuildings). That is an effort well deserving of its own entry. As you move closer to your FDP your positions should become a little more complex. Again the same rules apply – do not create cover for the threat to use against you. Again I want to develop positions that can be fired into from the FDP with little to no frontal or flank cover that can be used by the threat in its advance. These positions can be a little deeper due to their proximity to the FDP (angles of fire downward tend get steeper as you get closer). So where do we put our positions? This is where I’m going to diverge a bit from stated methodology. Naturally you’ll want to create positions to counter the most likely threat axis of attack however you also need to cite them to provide 360 degrees of coverage for your FDP and to provide cover for your egress from said position. I also want to place them in areas where I may require hasty cover if I am out from the main defensive position (i.e. cutting hay on the backside of the pasture). For those positions I need to site them where they will be reachable AND not cutoff by any current or planned obstacles (i.e. wire fences or water). If you have to take as hasty position away from your FDP you want as little as possible between you and your FDP. So looking at our map we can do some estimating of where good locations would be and what orientation they should have. I’ve nugged out a few here and give explanations for why they are there and their orientation. The positions and their orientation are annotated as the green bordered arrows and once again the fencelines and gates/openings are lines and rectangles. That’s a lot of positions for one ranch, right? Yeah it is. And truth be told I don’t want to be any further away from one than I have to – hell the closer the better. 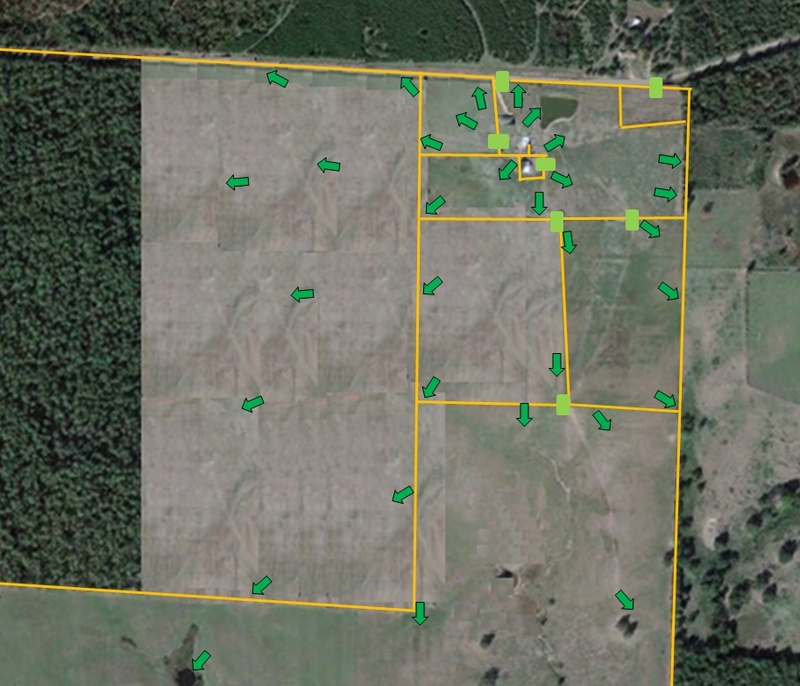 Now when I located these positions I wanted to minimize impact on my ranching while still allowing for a defense in depth, interlocking fires, and mutual support while being able to sight into them from the FDP as much as possible. So what I’ve done is attempted to locate them along fencelines and near gates wherever possible. This lessens the impact on the cattle and my ability to hay the fields while still giving me more than adequate coverage. Yeah there are some out in the field that is going to be a pain in the backside to mow around but that’s part of the tradeoff. In some instances (i.e. the pond in the south sector) I was able to locate it in an area that isn’t really agriculturally significant. Now when it comes to concealing positions nothing is better than nature. Let the grass grow up and turf them. If you keep it cut at a decent length it’ll protect the position from erosion and help camouflage it as a position in the first place. I really wouldn’t worry too much about sector stakes unless you have forward positions and then you need to mark their location on the front and sides of the position. Something as simple as a wooden stake driven into the ground with only a couple of inches exposed and lined up with those positions will help prevent you from firing into them if they are occupied. Anyhow once you’ve developed positions and routes you’ll need to map them. This is where something along the lines of a range card is a good idea. I’m not saying leave a range card in each hole – it wouldn’t last through the weather. But by having a range card at the FDP it helps us estimate the range to any given location thereby probably increasing the accuracy of our fires and giving us a handy reference tool to work with. I’m going to hold off on that for the time being because once we get everything situated we’ll be developing a sector sketch. The Air Force has published a Consolidated Manual on Fighting Positions. It’s a pretty good reference to have on hand. The Army also addresses fighting positions and cover in FM 5-103 the survivability manual as well as FM 3-21.75 The Warrior Ethos and Soldier Combat Skills. Additionally this is an excerpt from FM 5-103 that states the material thickness required to stop certain projectiles. The figure given for sand is double the normal 6 inches due to the factor of the Army calculating a five round burst into the material. IMHO you need at least 6 inches however as always cover=mass so the more the better. I have a few observations on this article. I intend for these to be constructive,(and hopefully somewhat helpful) as opposed to being completely negative. I think it would still be a good idea to have a couple stage 4 fighting positions somewhere in your plan, Hasty positions are all well and good, but they give you no cover from any kind of indirect fire. That may sound like overkill, but keep in mind that the standard infantry squad has indirect fire weapons organic to it, such as M203s, as well as the new M320s and the XM25s now being tested in the field(and that’s just our side). Granted that’s not necessarily going to be the opposition, but some other less than savory elements also have these weapons(and are currently acquiring them from the mexican army for example). They have definitely been used by the various fighting cartels south of the border. So if things got so bad as to require the use of defensive fighting positions out on the ranch, it doesn’t take too much of a stretch to imagine these weapons making their way into the hands of your local MS13 branch or( insert criminal element here). So somewhere in your plan should be some kind of real fighting position. That said, I wouldn’t replace all of your hasties with stage 4 positions, for the same reasons you outlined above. Another observation I will make is about the modified hasty fighting position. It seems to me that in order to make this type of position effective, you would have to know where the attack is coming from. The “standard”hasty fighting position will give you cover from almost any direction(except from the rear). This modified position you describe doesn’t look to give you very much cover from fire on your flanks(or if it does, it will severely limit your ability to place fire on your flanks). So in taking a quick look at your AO, it would appear to lend itself to the standard hasty for a chunk of your positions simply because if the opposition doesn’t exactly go where you expect them to go, you might be a little thin on cover using the modified hasty. Lastly, if you are going to the trouble to prepare some fighting positions, it might be a good idea to place some ammo in them. If things degrade to the point where the need to use these positions becomes a possibility, it would be reasonable to assume that you would probably keep a weapon on you while you go about your ranch duties. But it would be rather cumbersome to be carrying a full combat load+, like you would do if on a combat operation, while your trying to mend a fence or something. Even a couple spare mags would be helpful for you to either hold your ground, delay the advance of the opposition, or put down some fire so another friendly shooter can pull back to the next line of defense. In addition you could put a range card in that ammo can so you and your help will know what’s in front of your position, particularly after dark. I would even go as far as to stage some extra weapons in your FDPs. Of course, given the purpose of your property I might not take these measures today. But if things get to the point that your carrying a rifle “just in case”, it’s probably time to take these other measures as well. That’s my .02 for what it’s worth. Thanks for the comments. IMHO if it comes to the point that the threat is able to employ indirect fire then it’s shag time. I’ll tell you right up front – 18″ of overhead cover will stop one 30 or 40mm HEDP but not the second. My idea is not to get stuck in any fighting position too far away from the FDP thus avoiding singular isolation and fixation. A key thing to remember is an 18″ hole is an 18″ hole. 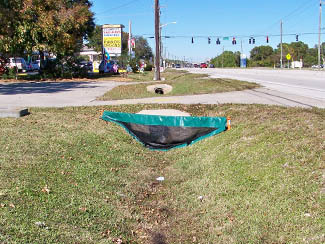 It’s 18 inches of defile cover usable in both directions. Given a lack of readily available manpower (at least until an RRDF arrives) we have to assume that for at least the first ten minutes we’re on our own and better defended by mutual support and interlocking fires during that timeframe. The modified hasty positions give us the ability to move from one covered position to the next while denying the threat the capability to do the same. I’ll get more into this once we start wargaming. Additonally I haven’t really touched the A zone defenses yet. That zone is where a lot of our heavier work is going. The ammo and rifles? I’m not an advocate to leave anything unattended and when we go into SOPs the things you pointed out are going to be taken into account along similar lines to what the Rhodesian Farmers used. I noticed that your modified hasty position looks a lot like a sun box for starting early plants, assuming it was facing the south and had a plastic cover. Would this be a way to put in some positions in advance while disguising their purpose? They could even be both: If you don’t get attacked you have garden plants if you do get attacked you have a position. That’s a good idea Michael. And it ties well into the latest entry about concealment.